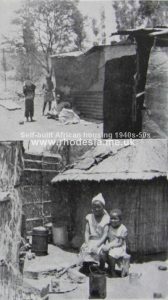 The photograph above of home ownership houses, financed and built by the Southern Rhodesia Government, is in striking contrast to the primitive and dilapidated dwellings shown below, and illustrates the tremendous advance in this sphere. THE AIM is to provide every married African working in an urban area with a decent house enabling him to bring up his family in comfortable and hygienic surroundings. THE METHOD being applied is large-scale planning, on the most up-to-date lines, of model townships with land provided for all necessary amenities. Government has undertaken responsibility for raising the initial finance required and has already commenced building work by departmental and contractor construction. THE ACHIEVEMENTS to date are townships consisting of 4,400 houses in Salisbury, 685 in Bulawayo and 400 in QueQue. Services such as water, sewerage, roads etc., are being extended in these and other towns in preparation for building as soon as contracts are concluded. 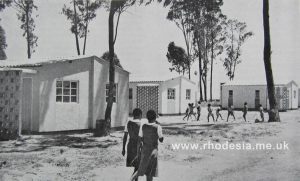 THE SOUTHERN RHODESIA GOVERNMENT is pushing forward with urgent plans in all areas where housing is needed. Home ownership is being encouraged and assisted in the view that a full appreciation of citizenship is best achieved by this means. INVESTMENT in African housing is also being encouraged by Government under guarantee schemes, full particulars of which may be obtained from the Secretary for Labour, Social Welfare and Housing, P.O. Box 8094, Causeway, Southern Rhodesia. This article was first published in 1960. It should not be overlooked that Rhodesia’s European population was providing in excess of 90% of the necessary taxation to fund these development schemes.